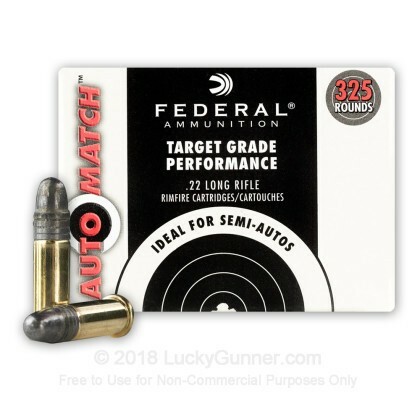 Federal's AutoMatch Target 22 LR ammo represents a great option for your Ruger 10/22. This ammo represents a step up in quality from traditional plinking ammo and is designed to yield higher consistency and smaller group sizes. If you're looking for great 22 LR ammo to reliably cycle your semi-auto, than look no further. This ammunition is manufactured in Minnesota by Federal and it is brass-cased, rimfire primed, non-corrosive, and non-reloadable. I use this ammo in my Browning Semi Auto to shoot rabbits and quail (Yes this is legal in Texas) on the senderos radiating from the elevated deer stand in South Texas. Shots are 100 to 150 yards. Do I hit em every time? Nope. I've got a cheap 3 to 9 x 40mm scope zeroed at 100 yards that shoots about 3 inch groups at this distance. I have experienced no failures of any kind with this ammo in this gun. I've gone through 1000+ rounds of this ammo between my 10/22 and marlin mod 60. Absolutely no feed issues or duds with the 10/22, only a couple feed issues with the marlin. Shoots decent groups. Great for plinking around, for the money these are a good deal. I've shot these pretty much exclusively in my Ruger 10/22 for over a year. They cycle well as long as the rifle is reasonably clean and well lubed. Accuracy is decent. I think these must be strictly for OUTDOOR target practice as they are quite smoky. Had a problem with several being duds, and there were a few of us using them. Not sure if I would purchase these again, may have to look at alternate shells. Purchased for a Ruger MKIII and Ruger SR22 target shooting. Worked great! No jams. No Duds. At 25 yards I shoot sub 0.4 inch groups with my M&P 15-22 and I don't pretend to be a world class shot just average a good gun/ammo combination. It's hard to find 22lr ammo here so I was happy to see it at such a good price. Service and quality excellent. Will be buying all my ammo from here. Promptly shipped and no problems with the ammo. Federal's always been my favorite ammo, Lucky Gunner is my new favorite ammo store. Good selection, speedy delivery, I'll be back! Perfect for paper punching and for zombie slaying ! Cycled very well in my Ruger SR-22. Was able to shoot 4-5 inch groups at 10 yards. My only gripe is that it's VERY smoky. It's almost unbearable shooting at an indoor range. Outdoors was obviously better but I needed a shower after shooting as gunpowder was all i could smell for hours. Shot well, I had no issues. The package arrived quickly and in good condition. I had no issues with these rounds. They shot beautifully. Great product from an incredible company! Keep up the great work Luckygunner! I was glad to find a source of .22 ammo. I especially am glad to find the federal target ammo. I have told my friends about your Web site. Purchased this ammo for a family member and he can't say enough about it. He is now a lucky gunner customer. I have ordered a total of 3 boxes. At the Range, I went through a box in a 10/22, Target Special. Firing was great. No miss-fires, accuracy was fine & not very dirty. I am ordering more. Thanks Heidi, Matt & the other folks at LG for the great C/S!!!! From order to front door was a matter of days. The price was very good, and the rounds are excellent. My grandson shot through two boxes in a day of plinking with a Ruger 10/22. I highly recommend! It's good to find .22LR anywhere. Thank you Lucky Gunner. The price wasn't the best but having it was. No jams, they performed well compared to some other LRs which are available but I won't touch them!! I said in the summary, Lucky Gunner had what no others had in my area, (Centralia, Washington). Looks like I have a new ammo store, lucky me. I shot around 100 rounds last Friday. This ammo is excellent. .22 LR ammo for plinking or squirrel hunting. I recommend it. I am enjoying my purchase and look forward to a long relationship! Works OK but I'd prefer more "Power" for cycling a pistol. There's not a single .22 round in our stores, so I needed an online source. I was pleased with Lucky Gunner's service. These are quality rounds. Same brand I prefer to use in my AR. I'll buy more soon. No misfires, no hang ups. We purchased a box of 22LR for target practice. All the shells fired well, no jams. We will purchase from Lucky Gunner again! Shipped fast, just like always. No jamming and tight groupings. What more can you ask for? This ammo is hard to find right now and you had it at a decent price and I received this package in 3 days. My nephew was a happy young man on Christmas morning. Thanks Lucky Gunner. No misfires, loaded well. More than I like to pay for "plicking", but a good product. Federal is by far one of the very best ammunition manufacturers in the USA. I gave this ammo 5 stars across the board in Value, Quality and Performance. The ammo is simply of great class. Federal is known to me for great ammo in 9mm, 40S&W and in 5.56 NATO calibers. The only problem experienced with this ammo when used in my ISSC .22LR M22 was a high rate of failures to eject. I don't attribute this flaw to Federal, rather to the firearm. Outside of this issue, Federal performed perfectly, accurate, and with very little powder residue attributing to the internals of the M22 (This is my biggest concern when I purchase any kind of ammunition). The ammo almost feels as though it was manufactured to keep the firearm clean, which helps both in cleaning-time of the firearm and in helping reduce corrosion. Perfect for any firearm! Happy customer! I always invest in Federal for all my ammo needs! With shooting silhoutte pistol. found this ammo to be very accurate. Out of 40 animals, able to knock 35 constantly. At time, 39 is possible. Bought these for my wife's gun. Every round was shot with no misfires. Great value in today's market. Fired 3 boxes through my rifle. No misfire and no jams. I would recommend this ammo. Good quality. Easy purchasing experience. Quick delivery. No misfires. Today 9/20/14, I ran 10, 10 round mags through my S&W 422, 6" barrel. No issues!!! This is the 1st time that I had used Federal AutoMatch 40 gr. LRN. I was really surprised by the accuracy. I would purchase some more now, but I have to put brakes & rotors on my Jeep. Thanks LG for the continued speedy shipping & the great C/S folks!!!!! Now, let's go back to the days of the Winchester 180gr., .40S&W Cal., non-bonded, Ranger Law Enforcement rounds. I would like 2K Rounds please!!!! HAHAHA!!!! shoots well, no issues feeding through my 10-22, very accurate. Performed as well, if not better, than expected! Very satisfied with the ammo AND the speedy servce of delivery to my door! Thanks, Lucky Gunner! I will be back for other ammo! The only reason the VALUE section was rated 4 was becaue .22lr ammo USED to be CHEAP. That I bought through Lucky Gunner was beacuse it was the best priice I fund on the iinternet at that time. As with everything I have purchased through Lucky Gunner, purchase was easy and shipping was quick. FEDERAL ammo is a known quality which is why I purchased it for the first to run through the new Henry mares leg and it was flawless. The Federal Long Rifle .22 ammo had no misfires and happy with them, will order again when needed. The grandson and I shot about 100 rounds through a Savage semiautomatic rifle without a single jam or misfire. I shot the crummy ammo we had in my single action revolver. 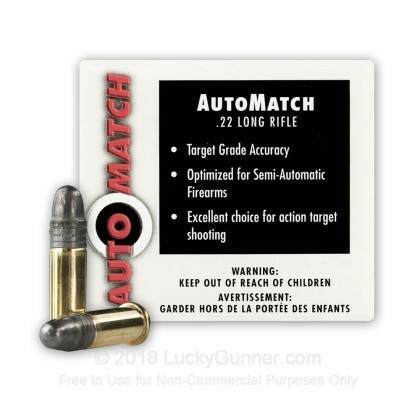 I am buying more of the Federal AutoMatch Target ammo today. Shot in both Browning Baby 1911-22 and Henry rifle good results in both. Glad to have been able to buy some. first of all lucky gunner is the best out there for ammunition for both value and service. fired about 100 rounds and the range with my Mark III with no misfires or issues. Good target ammo. Always a joy to work with you. Excellent quality, fast delivery. 500 rounds not a single failure. Pretty good ammo for an Ruger 10/22 carbine rifle. to use. Even the 8-10 year olds like shooting my .44mag Ruger Super Black Hawk. My review isn't about me. It's about these fine young girls and boys who will lead us some day, and the great service from "Lucky Gunner"
Ammo received as ordered and on time. HNY! This is an excellent product and I should have ordered more since they were in short supply. The ammo was ordered just to have target practice.....just excellent......if you get an opportunity add this product to your supply. 10% of rds failed to eject from my M&P 22. Accuracy was ok. I fired 90 rounds from my semi-auto, and several had insufficient energy to blow the slide back and eject. Accuracy was ok, but I would only use them on a range, not for personal defense. Good Qaulity and fast shipping. The price, as with all of the 22 ammo is high right now but the fact that there was ammo and that it was easy to purchase and have shipped made the price more than bearable and well worth it. I will use Lucky Gunner every-time I can in the future. I was pleasantly surprised at the speed of delivery and the quality of your product. The ammo did not cycle well in my S&W model 41. The ammo did not cycle well in my S&W model 41. It continually jammed the slide instead of ejecting. It apparently was too light a load for the gun. High priced, but very reliable. I've fired over 1000 rounds through my Ruger 22/45 and Ruger 10/22. I've had less than half a dozen jams from failure to feed. I had zero misfires and zero failure to ejects. The accuracy appears to be on par with CCI Mini-Mags. The price is steep, but I guess that's the nature of the beast these days. Used in a marlin model 60 .22. Fired 60 rounds or so. Weapon Christmas present for Mother. Still can't understand why she didn't want an AR-15 .22? Bought these for my Ruger 10/22. Used another brand of ammo to sight in the scope, and received excellent groups at 30 yds. I switched to this ammo for comparison, and had fliers in every group of 3. If I had used this ammo to sight the scope in, I would have still been at it. Despite the words "Target Grade" in the name, I wouldn't use this for serious shooting. 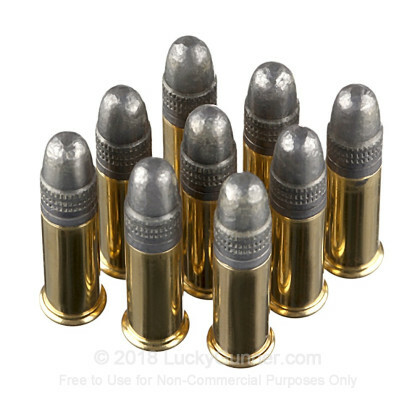 I have been looking for 22LR bullets and these were readily available. They work great, no misfires. Delivery was prompt and quality was Great. I've use these federal 22's for quite a while. I use them in target competition in the phone well. No chance to test the ammo at this time. Very fast shipping and good to find .22 ammo!!! Can't find it in stores. Guess Obama is hoarding all the ammo. Hope to get a chance to shoot some of this ammo soon! Had to give the ammo away. Fired twenty rounds and had 13 failures to push the slide back or remove the used casing. Will never use this brand again. Only CCI Minimag works every time. Would recommend to others and will purchase again. This was my first purchase from co. Service was great. Purchased 2boxes (650) rnds. Fired Henry Golden Boy with no issues. All 3of us were completely satisfied. Will check back. very happy with my purchase,was shipped very fast. Thanks! So far, no jams or issues with my 597. Shopping experience is top notch. This was my first time ordering ammo online and I'm very happy with Lucky Gunner. Shipping was quick, quality is good, and the price wasn't bad given current conditions. I will definitely buy from Lucky Gunner again. One thing about Lucky Gunner is that you buy with confidence. What they say is the way it is. Once again they've proven that when they say they have it, you get it. Finally a place that doesn't lie to you about available inventory at a reasonable price. Just recently purchased and ARX 160 22L fed through like butter. The purpose of my review is not only the feed back of for the performance, value and quality. The quality of help is excellent, knowledge of the ammo was very helpful for the purpose of my use. When I get good help from people who are knowledgeable about what there selling in there field of expertise. That is priceless to me. 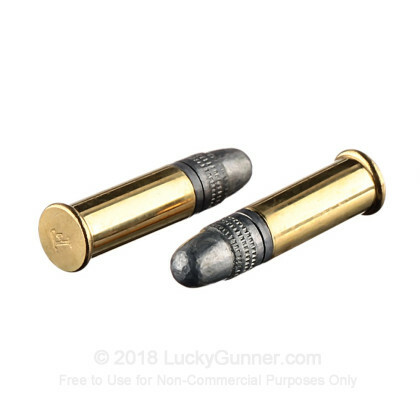 The luckygunner website is very helpful on sales when available. Ammo in calif is much higher I am well pleased with the service as well as the products sold. This is good ammo for practice and casual shooting but is not a particularly good value at current prices. It is reliable in all of my 22 autos with no failures to feed or failures to fire. It does not group as well as Wolf 22 LR however, and the Wolf is available for only a small amount more. Bench rested at 50 yards, the Federal Auto Match was grouping at about 2 or 3 inches vs 1 inch for Wolf. They work great in my Mossberg 715T, no jams after 200 rounds and pretty clean barrel! I have fired about 500 rounds of this ammunition through my Ruger 22/45 without a single problem. They have cycled flawlessly each and every time. Don't be fooled by "match" on the label. The best I can say about these is they are close to target grade. The group ok out of my 10/22 maybe 2 inches @ 50 yards from the bench. I shot some out of my sig 552 before I sold it and grouped about the same but cycled more reliably. I use Butler creek steel lip mags and I get a lot of Failure to eject with my 10-22 resulting in a brass over bolt type jam. I am going to try a different guide rod spring and clean clean clean my gun. But every 2-3rd round is not returning the bolt far enough to force ejection and then the spend round binds up against the new round as it chambers. My 10/22 has a standard sporter contour barre and a standard weight bolt. trigger group has been reworked and the action and barrel are bedded. I also have the KID receiver kit installed as well. CCI minimags cycle the gun flawlessly and group better for me than this ammo. This is the second time I've ordered from Luckygunner and I love this web site! These Federal rounds are only one of two bullet types that cycle through my High Standard pistol without jamming. 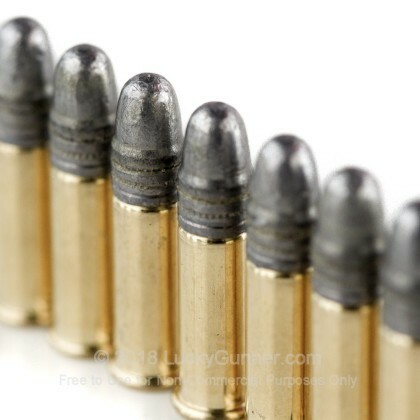 The bullet shortage makes it impossible to find these at local stores. Without this web site this pistol would be out of action in my pistol league. The price is not bad considering the shortage. I easily go through 200 rounds a week during our league season and having availability of these bullets and others I like is worth it. The web site is easy to navigate. The shipping was as promised. I'll order again from this site. A: These Federal match rounds will be a good fit in a Smith and Wesson 2206. These rounds are match grade and a great choice for some high-quality shooting. A: Sorry for the delay Scott. .22 LR cartridges like the Federal Match rounds you looked at would be perfect for your girlfriend's new Ruger SR22. (Nice gift, by the way!) Good luck with her at the range, we hope you both have a good time. While these rounds are relatively clean, you will want to make sure she cleans the firearm after any significant use. 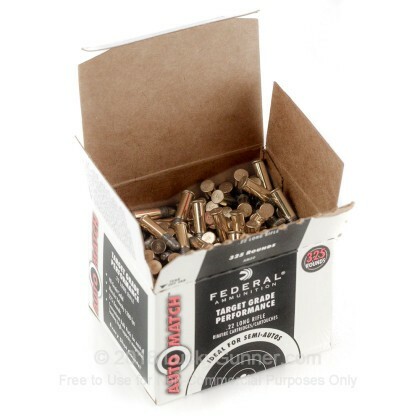 We also have this 22 LR - 40 Grain LRN - Federal AutoMatch Target - 3250 Rounds ammo in stock in a bigger quantity.